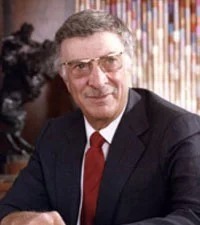 Jerome D. Jerry Mack was a pioneer Las Vegas financier who co-founded what is now the University of Nevada Las Vegas, operated downtown and strip resorts, served as vice chairman of Valley Bank and was a venerable leader in the Jewish community. In 1929, at the age of nine, Jerry moved to Las Vegas with his family and became a member of the first graduating class of Boulder City Grammar School. He was also a member of the Las Vegas High class of 1938. Jerry graduated from UCLA and married Joyce Rosenberg in 1946. In 1954, Mack founded the Bank of Las Vegas, which in 1969 he merged with E. Parry Thomas five-year-old Valley Bank in Reno to form Valley Bank. Years later, it became Bank of America. Jerry was past president of the Riviera Hotel and Casino and past director of the Four Queens Hotel and Casino and the Dunes Hotel and Casino. Perhaps nowhere is Jerrys contribution to Las Vegas more evident than in higher education. In the 1950s, he worked with Maude Frazier and Archie Grant to establish Nevada Southern College, which became the University of Nevada Las Vegas. Jerry, along with Parry Thomas, started the land foundation at UNLV, which in 1967 added 400 acres to the campus. When they later funded the campus basketball stadium, it was named the Thomas Mack Center in their honor. Jerry also served on the committee that established the UNLV Board of Trustees. In 1991, Jerry spearheaded the McCarran Center, a 100-acre master-planned office park a mile south of McCarran International Airport that includes a hotel and several restaurants.